Born in a county where more than 20,000 people are skilled acrobats, Yin Bo has spent most of his life performing around the country. Yin, 47, returned to Linquan county, Anhui province, recently from Guangzhou in Guangdong province for a weeklong acrobatics festival. Instead of a traditional performance, Yin introduced a new program combining acrobatics with magic, telling the story of a magician who is put under a spell by a wizard and forced to torture his lover before he is able to free himself and take his revenge. 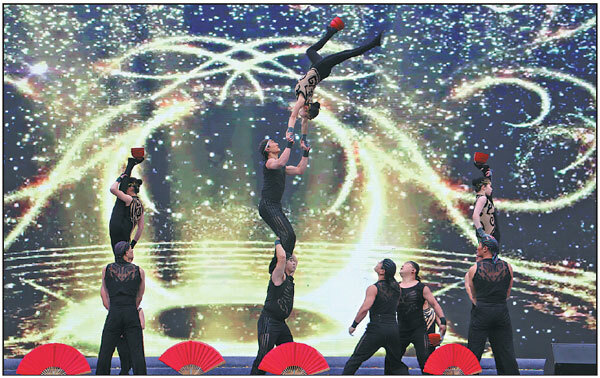 "The acrobatics industry has changed a lot in the past three decades, during which I have made great efforts to keep the business running," said Yin, deputy head of the Feiyang Acrobatics Troupe. Yin and his sister, who heads up the troupe, inherited it from their father Yin Yanchun. With more than 60 members, mostly based in Guangzhou, the troupe has seen annual earnings exceed 2 million yuan ($304,190) in the past few years, according to Yin Bo. Linquan's cultural authorities said the county has over 1,200 troupes and more than 20,000 acrobats, with most touring the country for business. "The local market is too small to support all those acrobats," said Yin Bo, adding that Linquan enjoys nearly 2,000 years of acrobatic history and is recognized as the home of this kind of folk art. Linquan, home to more than 2.3 million people, is China's largest county in terms of population as well as one of its most underdeveloped areas. "As acrobatics is painstaking and dangerous, performers are mostly from poverty stricken families," said Yin Yanchun, 70, who was from such a family and started to learn acrobatics when he was only 10 years old. "Performers should start to practice acrobatics between 8 and 15," said the elderly acrobat, who started teaching his son before he reached 15 and then sent him to join a Shanghai acrobatics troupe.